All accommodations, luggage transport, 5 breakfasts, 3 dinners, route notes and maps. From the Norman invasion of England to the D-Day landings, Normandy has long played a huge role in European history. 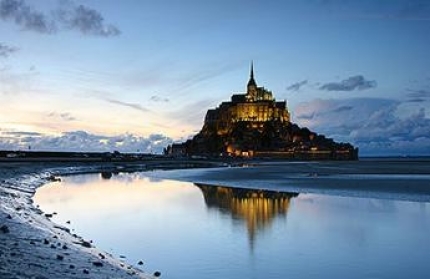 This rich and often brutal past is brought to life by the spectacular island monastery of Mont St-Michel; the Bayeux Tapestry, world-famous for its scenes of 11th-century life; and the cemeteries and memorials along the D-Day beaches, places of solemn pilgrimage. Normandy has many charms, from the beautiful countryside and the lovely local architecture and certainly the attractive cliffs and beaches along the coast. It is truly a region with something for everyone! On this trip we highlight the journey from Bayeux to Honfleur, considered to be by many the most spectacular part of Normandy. Using quiet country roads, we travel along the coast stopping to take in the sense of history that this region inspires. With lush rolling pastures and cows grazing among the orchards, Normandy is also a wonderful location for fine French cuisine as you discover Norman specialties and its particular gastronomy.